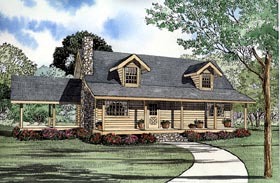 A quaint gabled porch and sunroom are the extras in the luxurious log home plan. You?ll have plenty of decorating options in the great room composed of a living and dining rooms and kitchen with angled bar seating. The dining room with French doors opening into a gabled porch perfect for morning coffee and your loved one. A glorious master suite has a walk-in closet and private bath. An adored sunroom will allow you to customize living space for every season while the upstairs bedroom and loft give you room to spare for company.